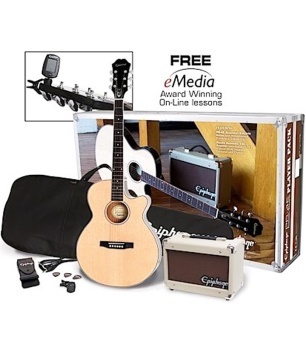 Epiphone introduces their first-ever acoustic-electric player package featuring everything you need to get started. At the heart of this all-in-one package is the PR-4E acoustic-electric guitar with select Spruce top and Mahogany back and sides. An Acoustic-15 amplifier provides you with 15 watts of power, 3-band EQ, and Chorus. Free downloadable eMedia Guitar lessons included with pack.